Michael Miller’s music is pretty, and sometimes slightly melancholy. 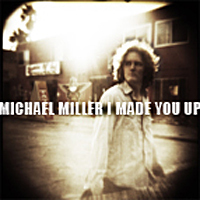 I Made You Up is made up of ten moody songs, which are colored with Eric Heywood’s prominent pedal steel work, even though country is the last label you’d slap on this collection. Instead, tracks like “Carolina Skyline” give it more of a life-out-in-the-country feel. Miller surrounds himself with a few high profile musicians, such as Patrick Warren who adds in nearly every conceivable keyboard sound. Another keyboardist, Rami Jaffee, has played with The Wallflowers, Foo Fighters and Pearl Jam. Mike Roe, an amazing guitarist/singer/songwriter in his own right, contributes to a few tracks, but you hardly even notice him. That’s really saying something, because Roe is certainly no wallflower. Although quiet and subdued, Miller comes up with a few lyrical gems throughout this work. “Sweetness” is particularly fine, especially when he worries, “Honey, where’s your sweetness gone/Someone’s filled you up with stone.” Other times, the imagery is a little on the strange side, yet still works. “I’m your little fishy,” he admits during “Tipsy”, swimming in your head.” Okay, if you say so, Michael. Brendan Buckley, who co-produced this disc along with Miller, also deserves a lot of the credit for giving this release its consistently pleasing sound. Some of these tracks feature up to nine musicians in the mix, which is quite a balancing act. Miller’s been kicking around the music scene for quite some time now; he really deserves to be much better known. Let’s hope I Made You Up helps make up for lost time. To check out more about a Michael Miller, please visit www.MichaelMillerCrusade.com or www.myspace.com/michaelmillercrusade. I love how Michael Miller writes in metaphors. He really lets his creativity show on his records.